I’m a great one for recognizing how I should have handled a situation once it’s over. For example, yesterday my daughter was questioning me about a decision I’d made, and I was struggling to come up with an answer that I thought would explain it. I didn’t do a very good job. A couple of minutes later, after we’d gone our separate ways to get dressed for church, it came to me what I should have done. I should have said a quick prayer for wisdom in that moment. Parenting teens – make that parenting in general – can certainly make you realize your need to be in a constant state of prayer! If I want to be a better wife, a good mom, a wise woman, I will seek to live in an attitude of prayer. Why do I think that praying always is an important enough characteristic to be one of the steps toward becoming a wise woman? Let’s look at these three verses. It’s been talked about before, but I want prayer to be my first response, the initial reaction to a trial, a temptation, some uncertainty – which would have served me well yesterday! Yet living in a prayerful way also includes thanksgiving. Actually taking the time to stop and offer a prayer of thanks when you get that phone call or text or letter in the mail with good news is an important aspect of our prayer life. Have you found that you tend to pray more when you’re going through a trial than when life seems to be going along smoothly? When I’m struggling, I see more clearly my need for God, and my own lack of power or control. I’ve seen God use those times to bring me into sweeter fellowship with Him through increased prayer. 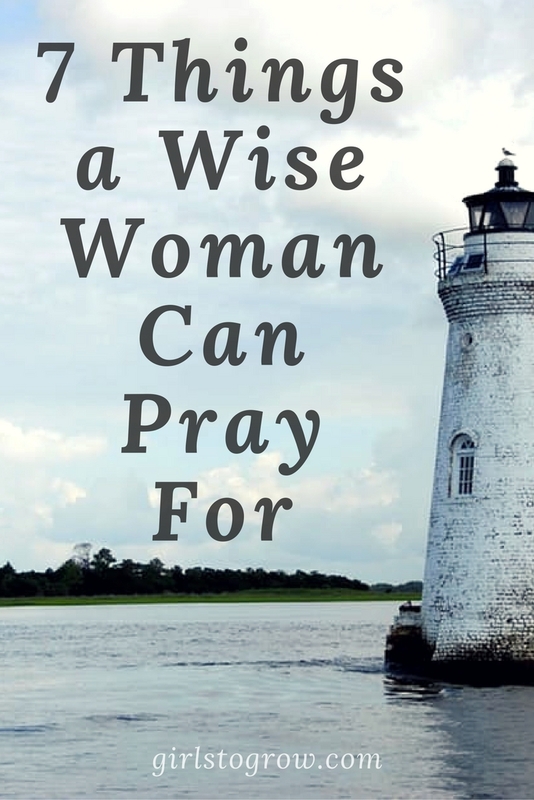 So what would a wise woman pray for? Here are seven ideas I’ve found that are based on Scripture. 1. God’s will to be done. The first four on this list come from the “Lord’s Prayer” in Matthew 6. Verse 10 says, “…Thy will be done in earth, as it is in heaven.” We certainly want God’s will to be accomplished in our lives and in the lives of our family. We also can pray that His purposes would be fulfilled in our world at large, and that the message of the gospel would spread to those who have never heard. 2. My daily needs to be met. Verse 11 says, “Give us this day our daily bread.” We’re not told to ask for what we need in the future, but that we will have what we need for this day. I pray this prayer, then trust that God will provide what He wants me to have today. 3. Forgiveness. Moving on to verse 12, we read, “And forgive us our debts, as we forgive our debtors.” I need God’s forgiveness on a daily basis – and I need to be just as quick to offer forgiveness to others as I am to go to God and ask for it for myself. 4. Deliverance from evil. Finally, verse 13 teaches us to ask the following: “And lead us not into temptation, but deliver us from evil…” I can pray that God will help me recognize temptation and then give me the strength to turn away from it. And isn’t it neat to look forward to heaven, realizing that the ultimate answer to this prayer will be answered there when evil will no longer be present! 5. Wisdom. Here’s the verse that I thought of a bit late yesterday! “If any of you lack wisdom, let him ask of God, that giveth to all men liberally, and upbraideth not; and it shall be given him.” ~James 1:5 What a gift – to be able to ask God for wisdom with the promise that He will give it generously! It’s my own fault if I don’t take advantage of this as I should. It reminds me that He wants me to walk in victory and gives me the tools to do so. 6. The healing of others. “…and pray for one another, that ye may be healed. The effectual fervent prayer of a righteous man availeth much.” ~James 5:16 We know many that need physical, spiritual, and emotional healing. Our prayers can make a difference! This is one benefit of having a written prayer list. It reminds us to pray for those with needs, while reminding us to give thanks to God when those whom we’ve prayed for are healed. 7. Those in authority. “I exhort therefore, that, first of all, supplications, prayers, intercessions, and giving of thanks be made for all men; For kings, and for all that are in authority; that we may lead a quiet and peaceable life in all godliness and honesty.” ~I Timothy 2:1-2 Whether or not we like or agree with those who are in places of authority in various areas of our lives, we are instructed to pray for them. I’m convicted about not doing this as often as I should. I don’t currently have this as a regular part of my prayer time, so I need to change that! I’m reminded to pray by putting “prayer triggers” in my life – basically habits that remind me to pray. That may look like devotions or quiet time first thing in the morning, praying before meals, praying with my kids when they go to bed, etc. As I’ve mentioned before, I like to pray a blessing over my family every day at lunch time. It helps me think about what they may be doing at that point in the day, and ask the Lord to protect them and grant them His grace and peace. Next Monday we’ll look at a final step we can take as we seek to become wise women! Catch up on previous posts in this series here. I've got a written out prayer list for each day for my daily prayer time. Since I have five children, it works well to pray for each of them one one weekday. I used to pray for our country's leadership, but I've gotten out of the habit. I need to add them to my prayer list. Yes, I did find myself naturally praying for our country and its leadership during the election season, but I need to make it at least a weekly habit. You have a nice system of praying for one child each weekday!! Great thoughts on prayer. It's so easy to get focused on immediate personal needs and forget that there are others beyond the family that need prayer — and our nation especially! Thanks for these suggestions and thoughts! So on point! Thank you! I know that I personally always need to be encouraged in the area of prayer. Our pastor mentioned on Sunday that prayer is a spiritual activity that the flesh totally resists. Reminds me that prayer is work, yet it must be powerful if our old nature is that opposed to us doing it! Hope you are well and that you and your family have a merry Christmas!! This is like a combo of 1, 2, & 5, but I always find myself praying for God to order my steps each day – like even super basic stuff: "Lord, should I go to Costco first, or Trader Joe's?" I need to be more intentional about 7.